One of the best books I've ever read was Stealing Dylan From Woodstock, by Ray Foulk, who was one of the organizers for all three original Isle of Wight Festivals. It documented the planning and execution of the first, small festival in 1968 and its much grander follow-up in 1969. In particular, the 1969 festival was a real coup for the promoters, coaxing Bob Dylan out of his self-imposed exile to make his only headlining concert appearance in the seven years between 1966 and 1973. With that feather successfully nestled in their cap, they immediately set about planning the follow-up event in 1970, but it wouldn't go as smoothly. This time, booking the headlining acts was the easy part...it was appeasing the authorities and residents of the Isle of Wight during the planning stages that was the hard part, and it only got more chaotic once the actual festival began. In The Last Great Event, their second volume on the original Isle of Wight Festivals, author (and promoter) Ray Foulk and his daughter Caroline describe everything that went into planning and executing this largest-ever festival gathering of 600,000+ people and the aftermath, many effects of which are still felt today. Starting off with a brief background on the story thus far, recounting the famous 1969 festival and Bob Dylan's brief return to the stage, the authors dive right in where the first book left off: Fiery Creations, headed by the Foulk brothers Ray, Ronnie, and Bill, are looking toward planning the follow-up festival. Their immediate quandary was how to top Bob Dylan as a headliner? In their minds, only two other acts measured up: Elvis and the Beatles. Elvis was (rightly) deemed to be too square and a poor choice for a festival crowd, so they set their sights on trying to use their cachet from bringing Dylan out of retirement the previous year to get the Beatles back onstage in front of a paying audience for the first time since 1966. They had a few reasons to be encouraged: George, John, and Ringo had attended the 1969 festival and enjoyed it, with George playing unofficial host to the Dylans during their stay; the Beatles brief return to live performance at their London rooftop concert the year before also boded well. It even got as far as Ray Foulk drafting a letter to George inquiring into the possibility of the Beatles headlining, as he and George interacted quite a bit at the 1969 festival. However, the plan was scuppered before Ray sent the letter when Paul announced the Beatles split in April 1970. At this point, they decided that instead of having ONE absolute headline act, they'd spread the festival across five days and have several big names. These ended up including the Who, Jimi Hendrix, the Doors, Jethro Tull, Chicago, Joan Baez, and the Moody Blues as the some of the biggest namess. Attempts to get the Rolling Stones and Led Zeppelin were unsuccessful (can you even imagine if they were?) but nonetheless, from the very beginning of 1970 the festival was hyped by the music press and, once the acts announced in late May/early June, ticket sales picked up. There was one glaring problem, however...Fiery Creations didn't have a site to actually stage the whole thing! Denied the right to lease the same land from 1969 to use again, there was a lot of spirited debate with local officials and residents until a local landowner volunteered his farm at the eleventh hour. Faced with the prospect of a fully booked festival and tens of thousands of tickets sold, this was a nightmare scenario that was rectified before it was nearly too late. With this sorted, it was time to construct the site, erect fencing, and organize the logistics before the music began. With two weeks until the gates opened, the site was besieged by early arrivals as well as self-styled political anarchists and radicals who tried their best to sabotage the entire thing and force it into being free. This of course caused some stress as the promoters needed to raise revenue in order to pay the acts and keep everything running smoothly. In the end, it ended up being a series of minor skirmishes between the troublemakers and the festival organization until finally Fiery Creations threw their hands up on the final day of the festival and declared it free. As for the music? It was an incredibly eclectic and varied line-up, punctuated by some absolutely brilliant sets from the heavyweight acts: the Who were unarguably the highlight of the entire festival, but Jethro Tull, Taste (featuring Rory Gallagher), John Sebastian, Miles Davis, Leonard Cohen, the Moody Blues, Joni Mitchell, and the Doors all turned in excellent sets. Jimi Hendrix, probably the only act on the bill as big as the Who and the Doors, turned in a somewhat ragged and uneven but ultimately solid performance, mixing his established hits with the new material he'd been working on over the last year. It was also to be his final UK gig as he would die less than three weeks later, in London, under mysterious circumstances...a tragic and profound loss for the world of music. Ray Foulk goes to great lengths to set the record straight about how the festival was actually run, what occurred during it, and the fallout of its aftermath. Much of the misinformation that has unfortunately become accepted fact about the 1970 festival stems from both sensationalized contemporary press accounts as well as creative editing in the Murray Lerner film on the festival, Message to Love. There are, in fact, individual chapters toward the end of the book discussing the disruption of the festival by the small band of assorted radicals and the long and frustrating saga of the films based on the festival. 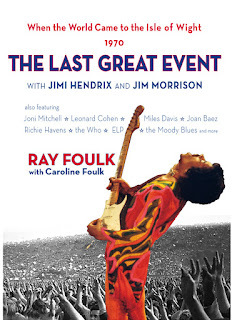 In discussing what actually happened, as well as the correct chronology of events (which was not presented accurately in the Lerner films), Foulk debunks many of the myths about the festival, including (but not limited to): Joni Mitchell being booed offstage, radicals rioting and tearing down the fencing, Hendrix playing through a fire on the main stage, and festivalgoers being unruly and problematic. All of these stories, and many more, are told as they actually happened either via Foulk's firsthand accounts or those of his brothers and associates, and most are corroborated with contemporary press clippings and statements from the authorities. Alas, it wasn't enough to prevent Fiery Creations from going bankrupt and the local government passing legislation banning further festivals from the island (even though the brothers had begun preliminary planning for a fourth festival in 1971). The Foulks did promote a few more big time rock concerts in London, at Oval Cricket Ground (with the Who headlining once again), Led Zeppelin's Electric Magic shows at the Empire Pool, and the 1950s rock and roll revival show a Wembley Stadium. Eventually they went on to other pursuits, making one last attempt at bringing the festival back to the island in 1994 and 1995 (even booking Oasis and Blur to headline!). It ended up falling through and they left it to others to finally revive the Isle of Wight Festival, which continues to this day, is widely recognized as one of the finest in the world, and stems from the Foulks legacy and for which they should be exceedingly proud. The Last Great Event is considerably longer than the first volume but I found it just as fascinating and hard to put down as that book. Even reading about the various pre-festival maneuvering and planning was utterly fascinating (who knew plans for catering and latrines could be so interesting? But they were!). Ray and Caroline weave their tale with just the right amount of humor and hindsight to paint a vivid picture...you can almost imagine that you were there in that field on Afton Farm at the end of the summer of '70. In addition to the engaging writing, the Foulks do a wonderful job of placing the event and its surrounding drama not only in the proper contemporary context, but in the broader context of the 1960s counterculture, with critical but fair hindsight. The standalone chapters at the end of the book setting the record straight on the fringe radical elements who were a nuisance the entire festival, as well as the selectively edited Lerner documentary, were very informative and certainly helped me in learning the truth about what really happened. Finally, Foulk's detailed description of each act's set lists, performance, and crowd reception is very enlightening and tells the real story behind each one. Apart from some very minor typos and printing errors (mainly stray punctuation marks or stray repeated words), the book is damn near perfect and includes several sections of wonderful full color photographs of the festival. For years, I had accepted the conventional wisdom that had been passed down since 1970: that armies of radicals stormed the site, tore down the fences, and rioted while causing the festival to break down into chaos and be declared free. This was based on all that I'd read and seen (in the Lerner film) over the years and, as I was to read in the book, turned out to be entirely untrue. For that fact alone, The Last Great Event is a valuable document, but it's also valuable for so much more beyond just that. It's a time capsule of a fantastic, unique, and magical moment in time, as told by one of the men who was there in the middle of it all and who helped make it happen. It's a detailed, fascinating, truthful, and revealing historical look at the last of the original Isle of Wight Festivals, as well as a look at the effects and impact it had both in its immediate aftermath as well as decades down the road...an impact which is still being felt to this very day. As the largest peaceful gathering in history and truly the last great EVENT, Ray Foulk reminds us to not lose sight of the fact that more than anything else, it produced five absolutely fantastic days of some of the best live music the world has ever had the pleasure to witness and hear. ANNOUNCEMENT: A Great Deal on Stealing Dylan From Woodstock...Grab it Now! 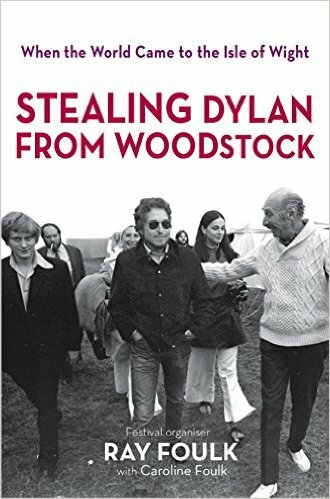 Longtime readers of this blog will recall that about a year ago I reviewed an excellent book on the legendary 1969 Isle of Wight Festival called Stealing Dylan From Woodstock. It was written by one of the organizers of the festival, Ray Foulk, and was one of the most interesting and enjoyable books I've ever read, really capturing a special moment in time while giving a glimpse of what the concert promotion business was like in those heady, more innocent days of the 1960s. I'm in the process of readying a review of its soon-to-be-released sequel, The Last Great Event, which chronicles the even more legendary 1970 Isle of Wight Festival. So why does this warrant a new post? Well, right now the folks at Medina Publishing, who produced both of these great books, have a special sale going on right now to celebrate the 75th birthday of the 1969 Festival's headliner, Bob Dylan! On May 23rd and 24th, you can get the print edition of Stealing Dylan From Woodstock for 25% off by using the special offer code DYLAN75. Just head straight to their site by clicking HERE and grab this fantastic book...what a deal! 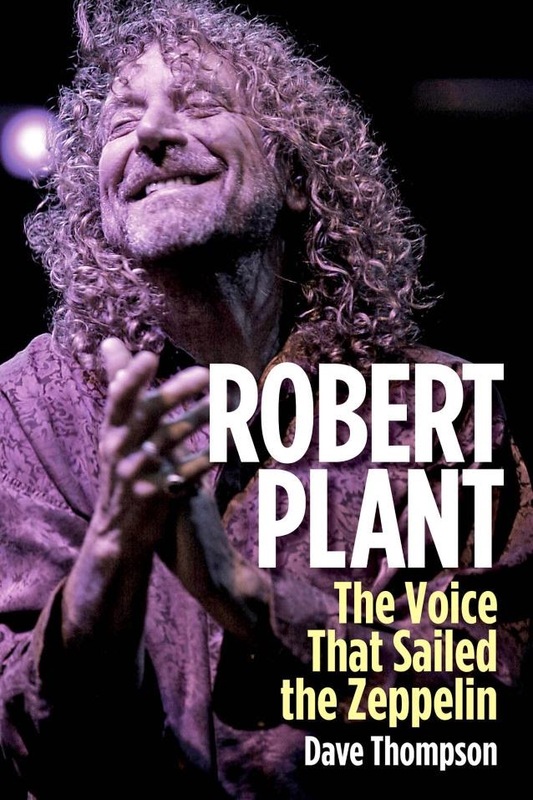 If you need any more convincing, go read my review again, but I can assure you that if you're a fan of Dylan, the Who, or any of the other bands who played at that first festival, or just a fan of the 1960s in general, this is a book you will thoroughly enjoy. As one of the most legendary, important, and successful bands to come out of the 1990s UK music scene, Suede exploded in popularity in 1992 before they ever released a note of music, simply via word of mouth and their electrifying live performances. Propelled by the songwriting team of singer Brett Anderson and guitarist Bernard Butler, the band was at the peak of their powers before it all spectacularly fell apart in 1994. Regrouping with a teenage fanturned new guitarist and an added keyboard player, the band reinvented themselves and reclaimed their place as one of the top UK bands of the 1990s before dissolving amidst some bitterness in 2003. A surprise reunion for some gigs in 2010 led to yet another phase of their career which, two new albums and numerous shows later, shows no signs of abating in 2016. Author David Barnett, a longtime fan and former employee at the band's offices, originally wrote their authorized biography, entitled Love and Poison, which was published in 2003 right at the time of their split. The defining book on the band, it was suddenly out of date when the band got back together; luckily, Barnett revised and updated the book for a new edition in 2013, and it is this new version that is the subject of the following review. 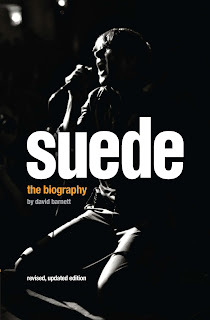 Drawing on extensive interviews with all of the band members, managers, producers/engineers past and present, and countless diehard Suede fans, David Barnett weaves the tale of a band that began with two lower class boys from an undistinguished London satellite town in the early 1980s. Brett Anderson grew up in a poor and eccentric family, falling in love with music during his childhood and plotting his escape from a town where nothing seemed to happen. Along with childhood friend Mat Osman, Brett dreamt of being in a band and using music as a vehicle for success and transcending class. After a brief stint at university in Manchester, he transferred down to London and formed a band with his new girlfriend Justine Frischmann and Mat. After putting an ad in the music papers for a guitarist, Bernard Butler joined and the songwriting partnership that would fuel Suede to success was born. These early years were marked by a lot of hard work and self-belief, albeit with little success to show for it. Justine eventually splitting with Brett and taking up with Blur's Damon Albarn inspired Brett's lyrics to take a darker, more personal turn and her leaving the band right after drummer Simon Gilbert joined had a galvanizing effect on Suede. However, after their initial run of acclaimed singles and their first two albums, things came to a head and Bernard Butler left the band in mid-1994. Bringing in new guitarist Richard Oakes (then only 17 years old) and Simon's cousin Neil Codling on keyboards, Suede reinvented themselves and went on to another era of success before limping to their end in 2003. Suede's comeback in 2010 was the impetus for a revised and updated edition, and this has been done in a rather unique way. Instead of simply tacking on a chapter at the end or cutting and inserting whole swaths of text throughout the book, Barnett went through the entire book and extensively annotated it with footnotes. These serve to not only bring the story up to date, but use the benefit of hindsight to reflect not only on his writing style, but many of the people and events referenced, bringing them all up to date. Additionally, numerous longtime Suede fans, many of whom went on to become friends and employees of the band, share their insights in these footnotes which, in keeping with Suede's music and fan community, serves to further include the reader into the Suede family. 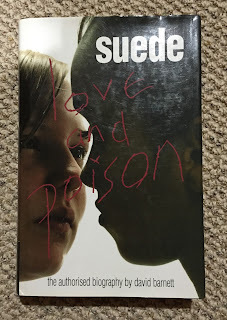 It's hard to explain, but if you're a Suede fan and you read this book, you'll know what I mean. What was a bit shocking, though, was how disdainful a few of the fans repeatedly quoted throughout in the footnotes were toward the band...a couple of them in particular came off as quite antagonistic and dismissive of anything the band has done since 1996 or so. The honesty, especially in an officially-sanctioned book, was refreshing, but also a bit eye-opening as it wasn't what I would've expected! While most of the text in the actual book has remained unchanged, all of the corrections and clarifications are made in the footnotes. Initially, I thought this would made the book cumbersome to read, but it didn't in the least. Even better, there were some genuinely funny and laugh-out-loud anecdotes from Barnett that really helped to show one of the things often lacking in discussions of Suede: their humor. The additional information also bolstered Brett's assertion on the inner book jacket at how ridiculous and surreal so much of the band's history has been. However, it's nice to read that for all the drama and controversy throughout their career, they've all remained relatively grounded and come out the other side intact, still enjoying each other's company to continue making great music. As the author rightly pointed out, no one has ended up dead or in prison and for that, all involved should be thankful. Sandwiched in the middle of the book are two sections of photos, including many from the personal collections of the band. Most fascinating are the ones showing the band in their younger days, especially in their early five-piece incarnation. The only person who declined to contribute to the book was, sadly, the person I and most Suede fans probably wanted to hear from the most: Bernard Butler. While Barnett did meet with and interview him, Bernard asked that none of the material be included in the book. The only contributions from Butler therefore come from previously published interviews he'd done with magazines and newspapers in the past, and while the author does an admirable job trying to present Butler's side of the story when it comes to his split with Suede, one can't help but be wistful as to how much more informatively it could have been done had Bernard consented to his involvement in the project. This is especially true when considering Brett and Bernard's 2005 reunion band and project, the short-lived but excellent The Tears. In fact, the book overall feels a little Brett-centric, which is understandable as he's been the face, voice, and only continuous creative force in the band throughout its history (with apologies to Mat and Simon, who of course have been in the band from the beginning, but don't write or sing any of the songs!). In places the book almost does feel like a biography of "Brett Anderson, member of Suede," rather than the band Suede itself, but their histories are obviously one and the same, and Brett's various tribulations so entwined with the band's fortunes that it's unavoidable. My one and only glaring complaint with the book is that it feels as though the bringing it up to date with the footnotes feels a bit rushed, falling a bit short at the end. The final chapter, describing the band's 2003 split as it did in the original addition, is supplemented with a couple of extended footnotes bringing the story up to present. However, it does this is a very general sense...what I would've liked to have seen is one final, added chapter to bring the story up to date in a more fleshed out and detailed manner, including the whole saga of the Tears and what led to the 2010 reunion and the new albums. That would've made the book even better than it already was. However, David Barnett's Suede biography is a book I've read several times since 2003 and one that lends itself to repeated readings. If you're a fan of the band, their music, and the impact they had on the UK music scene of the 1990s (as well as their later career renaissance which continues to this day), then this book will be endlessly fascinating and absolutely essential to you. Today is Mother's Day here in the US, and even though it was initially an artificial holiday (still) promoted by the greeting card companies more than anything else, it *is* a nice chance to stop and acknowledge one of the most important people in our lives: our mothers. And I don't just mean our own mothers, but all of the mothers in our lives who love, nurture, and encourage us from the moment we're born and throughout our lives. For me, personally, I'm thankful for my beautiful and amazing wife who is the mother of our four children. She is so loving and patient with them and I feel so blessed every day not only to have her in my life, but to have her as the mother of my kids. She really runs our household and keeps everything going smoothly and on schedule...I have no problem admitting that I'd be absolutely lost without her in so many ways, not least of which would be keeping the kid's lives going properly. Yes, I am perfectly capable of taking care of my kids when my wife isn't around, but she is the glue that holds our family together and she's also my rock and the anchor in my life. For that, I'll forever be grateful...I love you, K! My own mother has been there for me throughout my entire life, always encouraging and indulging me. I don't mean that she let me do whatever I wanted...my parents were strict (but fair) with me growing up. Rather, I mean that anything I wanted to try, from playing a sport or musical instrument, writing or taking art lessons, anything, she was always willing to let me try for myself to see what I liked and what I was good at. It was also through my mum's (and my dad's) love of and vast knowledge of music, especially from their era of the 1960s and 70s, that I came to my own lifelong love and obsession with music. Whereas I explored my dad's record collection and discussed bands with him, my mother always had the radio on in the car or the house and knew just about every song played when I heard something that caught my ear. My love of catchy pop songs and one-hit wonder fluff from the 1960s to today is because of her. I'm still super close to my mum and I don't know what I'd do without her. I love you, Mum! There are other mothers in my life who mean so much to me who I want to acknowledge...my two grandmothers, who have always been so warm and loving and who taught me how to cook Greek dishes, my aunt/godmother who is like a second mother to me, my aunt who is so sweet and cool to be around, my great aunt who has always been like a third grandmother, and my mother-in-law who is always so helpful and generous. So take the time today to think about what all of the mothers in your life have done (and continue to do) for you and take a minute to let them know how much you appreciate and love them. To all of the moms out there, Happy Mother's Day! 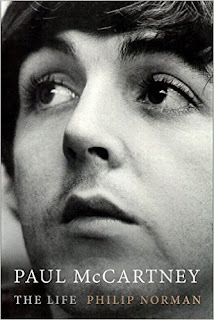 Well, here's a book I never thought I'd ever see in my lifetime...a biography of Paul McCartney by author Philip Norman, and with Paul's tacit approval, no less! Let me explain briefly. Norman's Beatles biography, Shout! (which I will be reviewing in the future) came out in the early 1980s and while it was well researched and well written, basically put forth the notion that John Lennon was, in Norman's own words, "75% of the Beatles." He was also very nasty toward Paul in the book, so much so that Paul spent years calling the book Shite! However, in 2003 Norman was asked by Yoko Ono to write an authorized biography of John...while he completed the book with unprecedented access to John and Yoko's archives, family, and friends, she revoked her authorization at the final manuscript stage. The book was still published and is, in my opinion, the definitive book on Lennon's life. One of the people who contributed to the book was none other than Paul McCartney. Eventually, as Norman describes in his foreword (more on this in a bit), he and Paul buried the hatchet and, when asked by the author if he had any objections to his writing a biography on him, Paul gave "tacit approval." What this meant is that Paul would allow anyone from his life to speak with Philip Norman if they wanted to. The resulting book, released on this very day of May 3rd, 2016, is the subject of this review. When I heard a couple of years ago that this book was in the pipeline, I was at first surprised for the reasons mentioned above, and then quite interested. In addition to Shout! and his Lennon book, I've read (and enjoyed) Norman's Mick Jagger biography and so knew what type of biography he was capable of writing. My surprise was due to the thawing in relations between Paul and his would-be biographer. In his foreword, Norman explains the origins of his animus toward Paul and how they eventually came to a detente. He first interviewed the Beatles backstage on their final UK tour in late 1965 and mentioned how the Beatle he most wanted to trade places with and live the life of was Paul, for his looks, talent, wealth, and girlfriend (the actress Jane Asher). He also spent time covering their Apple Corps. company during the late 1960s as the band was falling apart. However, he describes feeling almost betrayed by Paul in the wake of the band's 1970 split due to the (incorrect, as it turned out) public perception that Paul was solely responsible for breaking up the band and for suing his former bandmates. Additionally, he disliked Paul's music with Wings in the 1970s, thinking it lightweight and believing that he was squandering his musical talents by making music that fell far short in comparison to his Beatles work. There was then the upset over Shout! and numerous other things Norman wrote about Paul in the press over the decades (including a rather crude "obituary" poem that the author admits he now regrets). Eventually, Paul contacted him in order to see, in Norman's words, "what this person who hates me is really like." They had a pleasant conversation and Norman began to realize that maybe he'd been wrong about Paul. When later asking for permission to research a biography of him by contacting friends and family, Paul gave his blessing and the result is this book. Norman starts off the journey of Paul's life with, of course, his birth and childhood during WWII Liverpool, tracing Jim and Mary McCartney back a few generations in Ireland before the families eventually settled in England. The story of Paul's childhood and the formation of the Beatles has been told so often, in other books as well as by me on this site when writing about the various Beatles books I've reviewed, that it's not worth getting into again. I will say that, in his typical style, Norman gets through the Beatles years briskly yet thoroughly, covering all of the bases and hitting the high points without getting bogged down in too much of the minutiae since this isn't a Beatles biography. Honestly, I was glad to finally get to the Beatles break-up as I've read about them so many times before. He does have some interesting insight on Paul's five year relationship with Jane Asher, as well as the various semi-regular girlfriends he had on the side during that time. One of the central themes of the entire book seems to be Paul and Linda's nearly thirty-year marriage, which Norman goes to great length in highlighting throughout, starting with their initial meeting in the spring of 1967 and through their courtship, marriage, and eventually her tragic death from cancer in 1998. Over the course of the entire book, he consistently portrays her as a kind, loving, free-spirited, and strong woman who really was Paul's perfect match as they raised their four children together and shared the stage and studio during his solo career. One of my complaints about the Lennon bio was that only the last ~125 pages or so, out of over 600, was devoted to John's post-Beatles life. Granted, he only lived ten years after the band split, but it still felt like too much was crammed into too few pages. No such problem exists with this McCartney book, as half of its nearly 900 pages are dedicated to his life after Beatles. The section on the break-up, Paul's lawsuit against the other three to dissolve their partnership, and its effect on his mental and physical health was excellent. While the nuts and bolts of the split's machinations have been described in exquisite detail elsewhere, such as in Peter Doggett's excellent You Never Give Me Your Money (a book I will be re-reading and reviewing here soon), Norman focuses instead on how it affected Paul personally. Likewise the travails and successes of his 1970s career fronting Wings and the various comings and goings of the constantly shifting band lineups (save for him, Linda, and Denny Laine). Paul's infamous 1980 drug bust in Japan in described in more detail than I've read anywhere else and goes into some detail on his life in the Japanese prisons for that week and the various legal and political machinations that were necessary to extricate him. Paul's solo career to the present is covered in better detail than I've seen elsewhere and while there weren't any particularly jarring revelations, it was nice to see his down period in the 1980s covered in detail, as well as his involvement in the Beatles Anthology in the early 1990s and his subsequent late-career revival. Most touching was the discussion of his long and happy marriage to Linda and the emotions around her illness and death in 1998. It was hard to not get a little misty-eyed when reading about Paul's absolute heartbreak in the wake of her passing. His ill-advised rebound marriage to Heather Mills, as well as his subsequent, very-public divorce is discussed in fine detail, just letting the facts speak for themselves . Even so, Paul manages to come off looking much better than Heather, just as it happened in the court of public opinion. His more happy 2011 marriage to Nancy Shevell and his tours and new albums since bring the story up to date, and Norman bookends the story with an epilogue that again brings him personally into Paul's orbit. In late 2015 backstage before Paul's concert in Liverpool, he was part of a meet-and-greet with Paul. His reason for attending, besides having a new found respect and appreciation for the man, was to give Paul some brand new information in helping to recover Paul's original Hofner violin bass guitar, which was stolen from in 1969. Over the course of this final section, he admits that his earlier animosity was incorrect and misplaced and fully offers his appreciation and admiration, not only for Paul's career and place in music history, but for the overwhelmingly good person and loving family man he is. Quite a change from the attitude described in the foreword, let alone in the earlier Shout! As with all of Philip Norman's books that I've read, the prose and style is very easy and enjoyable to read, flowing nicely and making the book not feel like a chore at all despite its high page count. There were a few errors, such as calling the aborted Threetles song "Here and There" (it's actually called "Now and Then") and Linda's posthumous albums Wild Prairie (it's Wide Prairie) but overall the book got the important facts correct (at least that I saw). The level of research is impressive and overall, the book captures the essence of Paul McCartney, not only the supremely talented musician and performer, but the family man and private, guarded personality who nonetheless has done right by just about everyone he's interacted with over the course of his life. Norman managed, with Paul's tacit approval, to interview an impressive collection of people, most notable his brother-in-law and lawyer John Eastman who gave an impressive behind-the-scenes look at the chaos of the Beatles' Apple Corps and the breakup of the band precipitated by Allen Klein. Paul's pre-fame ex-girlfriends Dot Rohne and Iris Caldwell (sister of Rory Storm) also provided some interesting insight into his younger years when the Beatles were but one of many struggling Liverpool bands trying to make it. Likewise the information provided by Maggie McGivern, Paul's longtime "side" girlfriend during his years with Jane Asher, shed light onto his previously stated misgivings about the relationship and engagement with Jane before he met Linda. As for my final judgments on this book, I think it's an excellent comprehensive biography of Paul's entire life. It's certainly better than the Sounes and Carlin books, and never seems like it tries to get salacious or suggestive of anything untoward...rather, Norman lays out the facts in context and lets the reader take them at face value. I will say that it would certainly help to have read his Lennon bio as many things alluded to are done so with Norman assuming readers have read the companion Lennon book, as he calls it. While this book is, in my opinion, worthy of being the definitive biography of Paul, on the whole it was a bit less satisfying the Lennon book. Part of this might just be the fact that Paul had a relatively normal upbringing (the death of his mother aside) and grew into a normal adult, husband, and father, whereas John's life was anything but conventional and so his story would be a bit different. I also see this as being due to the new information Norman has uncovered, which is more filling-in-the-gaps than any great revelations, which is perfectly fine. If you want to get the most in depth account of Paul's life during the Beatle years of the 1960s, Norman's book gives a nice overview but more detail would be found in Lewisohn's book or Paul's own quasi-autobiography. Similarly for the Wings years, where Tom Doyle's book has more of the fine details. However, for a well-written, well-researched, and comprehensive look at his entire life, with Paul McCartney: The Life Philip Norman now has a pair of books, dedicated to the greatest songwriting partnership of the twentieth century, to his credit that can be considered definitive biographies on their subjects.